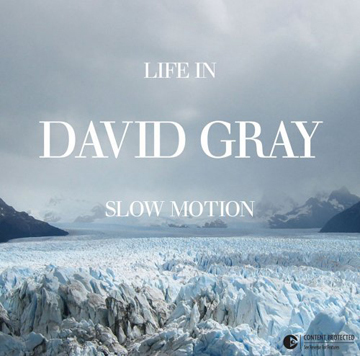 Life in Slow Motion, the title of David Gray�s seventh full-length, may seem to reflect the steady evolution of an introspective, characteristically hip British songwriter. The disc depicts the contemplativeness typical to his mod-ish kind. In actuality, however, the moniker is a neat manifestation of 10 wistful, symphonic tracks that are anything but fast-paced. In the past, Gray always chose to handle production duties himself, usually resulting in intimately lo-fi affairs. For Life In Slow Motion, he brought in Marius de Vries (David Bowie, Bjork, U2), who took Gray�s simple, vocally grounded musicmaking and plainspoken lyrics and superimposed them upon expansive orchestral arrangements � more than 50 musicians, from cellists to trumpeters, make contributions. The result is a single, solid movement beautifully balanced in its intricacies. The first track, �Alibi,� blends Gray�s inwardly projected voice with simple acoustic guitar figures, backed by piano, violins, and bass, and it serves as both road map of what�s to come and summation. Since his vocal instrument remains thin whether he�s describing existential quandary (�From Here You Can Almost See the Sea�), the evaporation of love (�Lately�), or frustration with modern-day brainwashing (�Hospital Food�), the symphonic additions function as exclamation points of sorts. When Gray is trying to make an intellectual argument, the drums and tympani pound with gravity. When he wonders at the world, full string sections accompany the vocal crescendo. And when he pours his heart out to the object of his affection, every instrument available comes to his aid. And why not? The complexities of life transcend what a guy can do with his guitar alone. Unlike his previous discs, Life In Slow Motion is not biographical. Gray has said that it�s a collection of snapshots from other people�s perspectives, which may explain his willingness to share the microphone. To inhabit other folks in song requires super-human emotional range � or help. On the torch �Slow Motion,� guest singer Natalie Mendoza adds an ethereal element that Gray could not have accomplished by himself. Life may be moving in slow motion for him, but enlisting the help of others has left Gray with a well-polished, mature gem that is perfect for quiet moods.